Students add their thoughts and comments to the class notes. “Note Taking” is done for the students. They record WHAT THEY SEE. 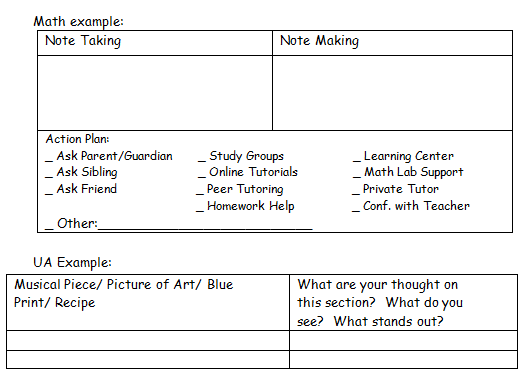 “Note Making” is for students to record WHAT THEY THINK or the WHY of what they see. They should think of explaining what they see using prior knowledge and vocabulary. This is their personal space and nothing written will be considered wrong. Note Taking/Note Making can be used to formatively assess understanding both by the teacher and the student. An action plan can also be developed by both the teacher and/or student.